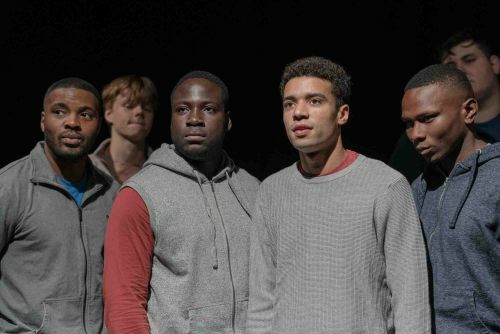 Over the next couple of weeks, the Young Vic has new shows exploring the effects of the criminal justice system and the experience of prison on young men convicted of violent crime. The Jumper Factory has been created with the men of Wandsworth prison, a chance for writer Luke Barnes to dramatise the multifaceted effects of life behind bars and its consequences for individual confidence, rehabilitation and reabsorption into society. 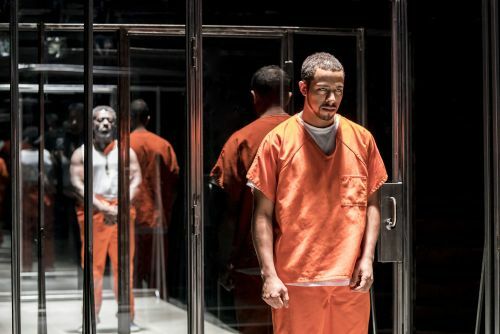 But first, there is a revival of Stephen Adly Guirgis’s Jesus Hopped the ‘A’ Train, a layered story of two violent criminals, the system they hope can save them and the redemptive power that comes from confession. In a New York prison, Angel Cruz is being held on remand awaiting trial for shooting a vicar who has recruited Angel’s best friend into a cult. There he meets eight-time murderer Lucius when they exercise together in the yard while the unrepentant serial killer talks about finding God. When Angel’s lawyer, Mary Jane Hanrahan, convinces her client to be patient and play the system to their advantage, he starts to dream of freedom, but with Lucius in his head and hateful guard Valdez gunning for them both, Angel’s certainty begins to waver. Kate Hewitt’s production, played out on Magda Willi’s traverse stage, is on the surface about the legal definitions of guilt and justice as two seemingly quite different men navigate the outcomes of similar crimes in a one-size-fits-all judicial structure. It asks insightful questions about the comparative severity of offences which in context appear so different – Angel’s an unfortunate accident resulting from concern for his friend, while Lucius’s spree was a merciless act of a clearly disturbed mind. Yet, writer Adly Guirgis has placed them both in the same outdoor cage at exactly the same time in corresponding orange uniforms. One of the drivers of this production, then, is the question of how different these men really are – the frustrated and withdrawn Angel alongside the confident and vibrant Lucius. And as the story unfolds, Hewitt expertly shifts our perspective on them both as they stand at opposite ends of the courtyard, engaged in the different stages of a tennis match. Willi uses movable plastic doors to demarcate their confinement, showing us the reflected and refracted nature of identity when seen through a transparent surface that at times also acts as a mirror. They are simultaneously themselves and a distorted version of that image, what the world sees is not the face they think they are wearing. As these men engage in their battle of wills, there is also a more complex discussion of faith and forgiveness. A central pillar of the judiciary system (in theory) is to accept punishment and then be returned to society a reformed man, but Adly Guirgis suggests that this is only possible if the condemned man feels penance for his crimes and accepts that he was wrong. In fact, he goes further to imply that societally-imposed concepts of right and wrong crumble entirely under the idea of a merciful God, and with sufficient faith God will determine who is damned and saved. The born-again Lucius even insists that his conscience is cleared of the multiple homicides he committed because it was God’s plan for those people to become his victims and they did not receive or deserve God’s protection. While noting the religious naming of the characters, Jesus Hopped the ‘A’ Train becomes an argument between Angel and Lucius about culpability, one that forces Angel to question his own role in the crime he perpetrated. Angel insists that human agency and free will are the cause of his predicament rather than the unseen predestination that Lucius subscribes to. The intensity of their conversation, so brilliantly portrayed in this production, is underscored by religious evocations throughout the story, in Lucius’s chants and verbal exclamations to the sky as he exercises, in Angel’s stumbling attempts to recall the text of the Lord’s Prayer as the play opens, and the shady relationship between the man Angel shot in a church – a Reverend no less – and the “cult” he appeared to be part of, all raising questions about belief, salvation, human agency and the price of clemency. There are also more grounded themes at play, not least in the structure of prison masculinity and its effects on modern male interpretations of bravado – something which The Jumper Factory is likely to address as well. Across this production’s two-hour run-time, Hewitt and her performers show us the flowering and reduction of the two men at its heart. Angel’s initial weakness blossoms into a much harder form of self-possession as he becomes more used to the forms of prison life and to the growing expectation of his imminent liberation. Where he was largely silent in his first meeting with Lucius, the tables are turned as the latter faces a transfer to Florida and looming death by lethal injection. Religious debate, then, becomes just one of the battlegrounds on which Angel and Lucius flaunt their masculinity, with their conversation increasingly embittered and vital as they spar and rail at each other’s personalities, crimes and likely future. Both are searching for a space to exist as themselves in a structure that dehumanises and anonymises them, whole complicated beings reduced to reference numbers and the felonies they committed (redolent of policeman Javert eternally referring to Jean Valjean at 24601 in Les Misérables). While physically separated by their individual cages – and this maddening sense of being trapped is evoked well in the claustrophobic set where the walls frequently draw-in on them – the two men try to physically intimidate and threaten each other, locking horns in an attempt to establish precedence, a desire to project a fearlessness they are far from feeling as they get under each other’s skin. This masculine bristling is given a slightly different form in the behaviour of the prison guards, the first who forms an attachment to Lucius is quickly removed for showing him too much humanity, while his replacement the goading Valdez is a cliché of the evil warden, but in the power games presented in this production, he acts as a reminder that however much they may jostle for position, ultimately they are at the whims of larger forces, an Old Testament God-like presence who makes them bend and submit at will, baiting them with the power to destroy at any time. No one really cares about these men or what led them to their crimes, and while a line close to the end gives an insight into Lucius’s childhood that makes some sense of him, it is a small moment in an externally controlled structure designed specifically to reduce and restrict them. As well as the guard’s behaviour, Angel’s lawyer Mary Jane Hanrahan uses her client to forward her own career, and as she monologues to the audience directly as well as interacting with Angel, it soon becomes clear that law is a game she needs to win, one in which coaching her client on how to behave and besting the opposition are more important than the man standing trial and the truth of what happened on the night of the crime. All of this is designed to take the power away from the men in prison, and crucially the audience is not shown key events like Angel’s trial and Lucius’s final moments, but have them relayed to us by characters with a paid role in the criminal justice system – the men themselves are prevented from telling the audience their own story directly, and we must deduce how much of the “official” version of events is correct from the performances. Ukweli Roach as Angel has an early vulnerability that instantly makes his character incredibly sympathetic, he’s overawed by the severity of the situation and the strangely distorting feel of the prison. Yet as the story unfolds, Roach shows Angel’s slow emergence as at first a brittle confidence begins to take shape which, as he starts to believe the lawyer’s hype about his certain acquittal, forms into something much less appetising. Roach never allows us to know for certain how guilty Angel really is and as the toll of prison life leads to several increasingly agitated confrontations with Lucius, an innate aggression and potential for violence is revealed. Whether Angel is really the victim of circumstance he claims to be or his own worst enemy is something Roach grapples with extremely effectively in the show’s final scenes, as he begins to doubt his own self-image. Likewise, Oberon KA Adjepong Lucius, pseudonymously known as the Black Plague, is also forced to reassess his knowledge of himself as Angel challenges his fervent trust in God’s work. Ebullient, energetic and bombastic at the start, Adjepong creates a character who frequently evangelises, utterly confident and unshakeable in his devotion to his faith. Yet there is considerable texture here too and Adjepong uses the strange contradictions of Lucius’s character to draw attention to the psychology of a man who sees himself as a victim of the state’s prosecution process. Lucius is beloved by his former guard, personable and friendly to Angel, sharing cigarettes with him and trying to ease his early experience of confinement. Yet, simultaneously, Adjepong convinces us that Lucius has coldly and guiltlessly murdered eight people on the spur of the moment. Similarly, he uses his build to intimate, refusing to be cowed by a bullying guard, yet relents when instructed by Valdez and is clearly affected by Angel’s insistence that Lucius’s guaranteed salvation is less than certain, that he rather than God should take responsibility for his crimes. All of these facets are made credible in Adjepong’s compelling performance of a man facing death and ultimately clinging to some kind of certainty to remain afloat. There is good support from Dervla Kirwan as the hotshot lawyer determined to acquit her client and relishing the courtroom battle ahead. There is an arrogance and a similar kind of delusion in Kirwan’s Mary Jane, a woman who also fails to see herself they way others see her. And Joplin Sibtain as the evil Valdez is equally contained by his role, both relishing the small-scale power he has over the prisoners, taunting them, while, as Lucius points out, equally trapped in the jailhouse and unable to show any kind of weakness that may undermine him. Jesus Hopped the ‘A’ Train is a multi-layered discussion about morality in all its forms and how the artificiality of prison with its removal of humanity and, perhaps quaint, concept of punishment, challenges concepts of responsibility and redemption. With so many themes to explore some get little more than a cursory nod, but in this Young Vic production these debates are enthrallingly staged.